Each year, the Today programme hands over the editorial reins to six public figures, giving them a chance to decide what goes on the programme between Christmas and New Year. 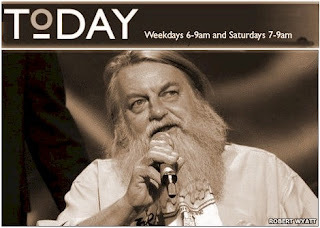 Editing the programme on New Year's Day is the musician Robert Wyatt. His programme will look at the music being made by amateur choirs around the country and at the people willing to stick up for politicians after the scandal surrounding MPs' expenses. 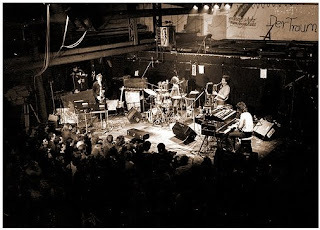 Quello che diedero il 16 marzo 1989 al londinese Mean Fiddler fu l'ultimo concerto dei Pere Ubu con Chris Cutler in formazione, e anche il primo con Eric Drew Feldman. Tutti in stato di grazia, per loro stessa ammissione e anche a giudicare dalle registrazioni messe oggi ufficialmente in circolazione, a più di vent'anni di distanza: le pubblicano in memoria dello scomparso Jim Jones, chitarrista di quel tempo, sia in forma ridotta per ReR - l'album si intitola London Texas - sia in forma completa in due volumi disponibili soltanto in download presso hearpen.com: Waltz Across Texas e Waltz By The Sea. Cutler ricorda: "A great live recording of the sadly short-lived version of the band that existed between the arrival of Eric Drew Feldman and my departure. By far the best recording of the Scott, Cutler, Maimone rhythm section, I think, and the whole band is on intense concert form: David racked up to 11, Eric working equally on foundations and fine details as to the out-there manner born and Jim Jones somewhere in the stratosphere. Coming back to it, this was a pretty great band. 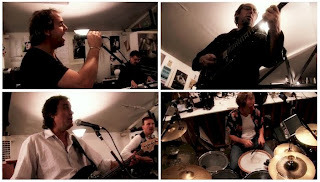 The songs are economical, tightly arranged and take no prisoners. And there's that live energy - the closest we can get to being when and where we weren't. Studio recordings can't do this." 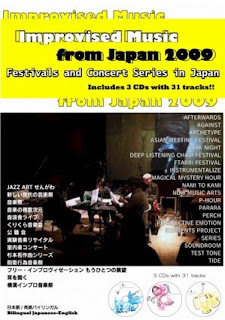 Improvised Music from Japan 2009 takes a look at improvised/experimental music festivals and concert series in Japan. Covered in the book are 33 of the many festival/series events taking place around the country. 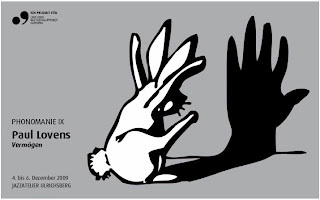 The articles (some written by the organizers themselves, others based on interviews of the organizers conducted in person or by e-mail) reveal the ideas, aims and feelings of the people on the small improvised/experimental music scene who work tirelessly to hold these events on an ongoing basis. There's also an appendix with photos taken at the 2008 Ftarri Festival Tokyo. In addition to the 128-page book (all bilingual English-Japanese), there are 3 CDs with a total of 31 tracks by 31 artists/groups, for an amazing range of music. Cantano la nascita di Pantagruel, non quella del Bambino. Ma si può lo stesso esser lieti: Three Friends ripresi in studio, nel Sussex. E tanti auguri! 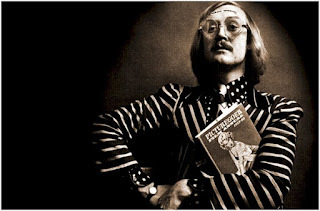 Great Lives, serie radiofonica di Matthew Parris su BBC Radio 4, si occuperà di Vivian Stanshall martedì prossimo, 22 dicembre, con inizio alle 16.30 (ora locale). Il programma andrà poi in replica anche la sera di Natale, il 25, alle 23.00. Intervengono l'amico e compagno Neil Innes e Ki Longfellow, moglie di Stanshall e oggi curatrice di molte sue memorie anche attraverso il sito web Ginger Geezer. Musician and performer Neil Innes discusses the life of his Bonzo Dog Doo Dah Band colleague and friend Vivian Stanshall. Neil recalls the moment he met Vivian Stanshall in London: he was wearing Billy Bunter trousers, a Victorian frock coat and horrible purple pince-nez glasses and carrying a euphonium. So began a friendship and a musical partnership that exploded into life with The Bonzo Dog Doo Dah Band, culminating in tours and TV series. Vivian's second wife, Ki Longfellow, joins the discussion to help explore the man behind the colourful public persona. 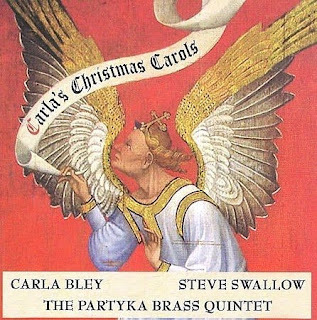 Assenti dal libretto che accompagna il cd, si leggono in www.wattxtrawatt.com/watt35.html le note a Carla's Christmas Carols, utili a comprendere la genesi dell'album e l'affetto sincero che Carla Bley nutre per il tradizionale repertorio di tema natalizio (ove peraltro non stonano due suoi originali, Jesus Maria e Hell's Bells). L'amore per la canzone, capace di sorprendere e comunicare con musica e parole in forme antiche e nuove, accompagna da sempre David Garland sia nella produzione in proprio, come autore e interprete, sia nei molti programmi radiofonici di cui egli è animatore, lucido e sempre accorto: primo tra questi è Spinning On Air, in onda da più di vent'anni per la newyorkese WNYC. Ne porta il segno anche il calendario di concerti - una ventina circa - che per questo fine mese Garland ha allestito presso il locale The Stone: “The emphasis of my programming at The Stone during the last weeks of 2009 is on musicians who subtly, insistingly, and creatively expand the potential of song. 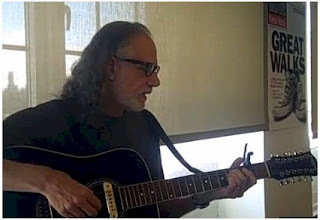 By investing songs with both heart and brain, and by tapping into the alchemy of the understandable and the mysterious, these daring songwriters prove that the ancient combination of words and music can still yield surprises, open new vistas, and permit and promote profound communication.” Garland stesso si produrrà in un paio di occasioni, una delle quali - “Processing Xmas”, la sera di Natale - assieme al figlio Kenji. "The 4 released albums will be thoroughly re-mastered and there will be at least one CD of unreleased studio and live material and at least one DVD of live and studio footage, including a mini documentary made during the recording of A Face We All Know: 5 or 6 CDs and a DVD - in the usual sturdy box with a fat booklet of documents, interviews, information, photographs, pictures, itineraries and miscellaneous memorabilia. Subscribers will also get an extra, otherwise unavailable, CD in a limited and numbered edition. In hard times for physical media, this inevitably will be an expensive undertaking, so we are asking anyone who wants to subscribe please to do so as soon as possible (no money will be taken until 2 months before release) - if it is released; and that will depend the number who are ready to assist the production with their subscriptions. In recognition all subscribers' names will be credited in all boxes sold. Hurrah Reel Recordings!!! Ha ragione Hans Voigt: la pubblicazione di Live at Henie Onstad Arts Centre 1971 è come compleanno, natale e ultimo dell'anno tutto in una volta. E allora, festa sia! 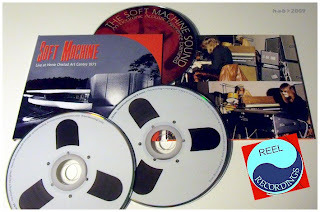 That the recordings made of Britain’s Soft Machine remain as rewarding and inspirational today as the moment of their making, qualifies the groups international stature as the most expressively intelligent of rock music’s progressive epoch. Born of the Beat Generation & Beat music, sacrificed on the clichéd tracks of jazz-fusion, the music in between by the classic quartet of keyboardist Mike Ratledge, saxophonist Elton Dean (1945-2005), bass guitarist Hugh Hopper (1945-2009) and drummer Robert Wyatt is mercurial genius manifest. Still and all, a creative apex where the music attained a ‘whole greater than its sum parts’, occurred on the evening of February 28th, 1971 at the Henie Onstad Art Centre in Oslo, Norway. Here, the group was afforded a rare crucible for their collective creativity by virtue of an intimate concert space, accurate amplification, and an appreciative audience. Also in Henie Onstad for his own Art Exhibition was Soft Machine’s friend Mark Boyle (1926-2005), who projected his sensory films during this concert. Thankfully, the performance was professionally recorded using classical ambient technique, and safely archived until the Henie Onstad Art Centre, and the musicians, granted Reel Recordings the honor and responsibility to present this magnificent recording for CD release. The results sound for itself as demonstrably the finest stereo recording of Soft Machine ever captured on tape. To celebrate and contextualize this two CD release a CD ROM including extensive notes and concert photographs is included. Live at Henie Onstad Art Centre 1971 is not simply another fascinating addition to a series of archival Soft Machine releases; it stands as nothing less than a gift for all. L'eccellente trasposizione su cd è opera di Mike King, estremamente rispettosa di quanto esistente sui nastri d'origine: "the 'sonic enhancement' consists of little more than manual level adjustments/corrections and a dollop of EQ. Otherwise what's encoded on the CD is the natural tape - No Compression/No Limiting/No Maximization/No sonically stupid processing/Nothing intrusive to compensate for having the recording amputated as an MP3. NO NEED! Several Soft Machine recordings have already suffered that disrespectfully dreadful 'approach' to the digital domain. All this recording requires is accurate amplification and it is unlocked as experiential. End-O-Rant." Dai concerti di Slapp Happy a Tokyo, Sapporo e Kyoto del maggio 2000 fu tratto un cd che F.M.N. Sound Factory pubblicò e distribuì l'anno successivo, ma solo in Giappone. Lo recupera ora Voiceprint e lo ripropone inalterato (senza cioè aggiungervi Coralie, brano che i sottoscrittori dell'epoca ricevettero come cd singolo): www.voiceprint.co.uk/web/Release/VP523CD. Che bello! Dave Stewart riprende da questo mese a pubblicare suoi scritti di musica, ricollegandosi idealmente alla serie 'Inside The Music' da lui realizzata per le riviste Keyboard e KM diversi anni fa. Lo fa presso il sito www.davebarb.demon.co.uk, con queste premesse: "For many moons I wrote regular music articles, starting in the UK magazine Sound International in 1979. That series became the basis for my first music book Introducing the Dots, first published in the UK in 1981 and reissued worldwide in 1992. I subsequently wrote an extended series of articles for Keyboard (USA) and KM (Japan), some of which were reprinted in Sound On Sound (UK). When I laid down my pen in June 1998 it came as a bit of a shock to realise that I’d amassed over 120 articles over the course of 13 years. They were mainly about my own music, but also covered the work of musicians I admire (Phil Miller, Mont Campbell, Bill Bruford, Django Bates, Andy Partridge, Eric McWhirter) and other areas which interested me, such as African balafon music, Balinese gamelan, harmonic theory, rhythm programming, working with samples, etc. Recently I found myself leafing through this archive in search of a notated keyboard part to a song Barbara and I were planning to play live (that's one of the advantages of writing about your own music - it makes you notate things which would otherwise be forgotten). As I searched the articles I remembered how much I’d enjoyed writing them; I also recalled that at the time of ceasing my Keyboard writing gig I’d vowed to continue the 'Inside The Music' series online, but somehow never got round to it. Well, after a break of a decade or so I have got round to it, and hope the results will be of interest to anyone out there who, like me, enjoys thinking about the inner workings of music..."
Con il titolo 'Lol Coxhill Soirée' Radio3 Suite mette in onda martedì 15 dicembre 2009 uno speciale concerto registrato nella sala A del Cprf di Roma lo scorso 19 ottobre. Con il sassofonista sono Roberto Bellatalla, Luca Venitucci, Luca Tilli, Mike Cooper e Fabrizio Spera. Inizio alle ore 20.30. 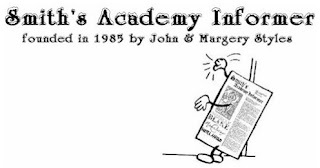 Un nuovo numero del periodico Smith's Academy Informer è pubblicato da pochi giorni in www.westbrookjazz.co.uk/sai/sai.shtml, ed è disponibile anche in formato .pdf. Recensioni e articoli riguardano al solito soprattutto le attività di Kate e Mike Westbrook, con uno sguardo complessivo a un'annata ricca di impegni specialmente per Kate. Al simbolico brindisi di stagione si unisce quello per celebrare dieci anni di presenza online del sito www.westbrookjazz.co.uk curato da Chris Topley. Cheers! 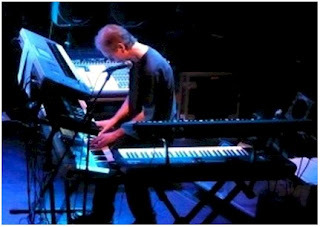 Stuart Broomer has written about music for numerous media, including Toronto Life, The Globe and Mail, amazon.com, and specialist journals, among them Musicworks; Point of Departure; Signal to Noise, Coda, Cadence, and DownBeat. He’s written over 60 liner notes for artists from a dozen countries, and in 2007 edited Secret Carnival Workers: the Selected Writings of Paul Haines (H. Pal/Coach House). 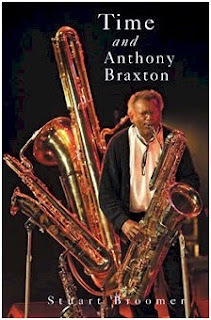 He teaches courses in Jazz History and Culture at George Brown College in Toronto. 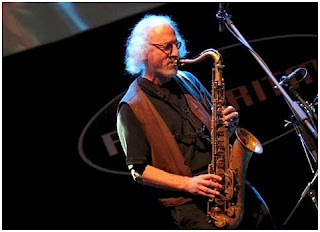 In coda a un giro di concerti in Europa con il suo Sax & Drumming Core Larry Ochs fa tappa in Italia per due concerti in trio con Alberto Braida e Fabrizio Spera: domani 10 dicembre a Milano (PiM spazio scenico, via Tertulliano 68) e l'11 a Lodi (Accademia di Musica F. Gaffurio, via Solferino 20). 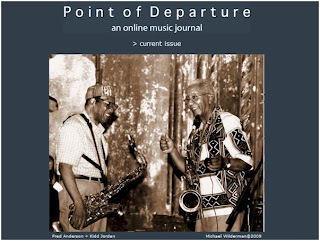 Point of Departure di dicembre 2009 è da qualche giorno online con numerosi articoli, recensioni, estratti da libri, saggi, interviste, il tutto al solito coordinato da Bill Shoemaker e sempre ricco di spunti di riflessione: si segnalano in questo numero una 'tavola rotonda' su composizione, sperimentazione e improvvisazione con le opinioni di John Coxon, Andrea Parkins e John Oswald; Art Lange su Bill Dixon; Stuart Broomer sul Derek Bailey degli ultimi anni, quelli a Barcelona; recensioni di album di Threadgill, Braxton, Brötzmann, la ristampa di Happy Daze/Oh! For the Edge, nuovi titoli per Louis Moholo-Moholo, Larry Ochs e Minamo e molto altro. In archivio si trovano anche tutti i numeri precedenti (il primo è del settembre 2005). Si inaugura tra pochi giorni a Nizza, alla Bibliothèque Louis Nucéra, una retrospettiva dedicata al settantacinquenne bassista californiano - da molti anni residente in Francia - Barre Phillips: la mostra rimane aperta fino a febbraio del prossimo anno ed è accompagnata da una serie di concerti incentrati sul rapporto tra musica, cinema, danza, improvvisazione e jazz. 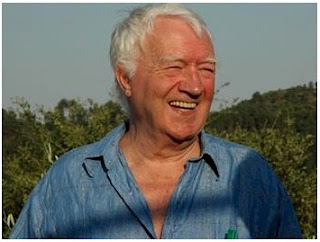 The Life and Work of Barre Phillips is the subject of an exhibition at Nice’s Bibliothèque Louis Nucéra, running from December 11 2009 to February 6 2010. 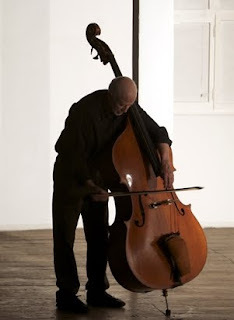 Titled 40 ans de création musicale, the exhibition looks at aspects of the great bassist’s work since moving from America to France in 1969, including documentation of many tours, recordings and more. Films and performance are also part of the programme, with Barre Phillips giving four Saturday afternoon concerts. On December 12, Barre gives a solo concert. The performance on December 19 is headlined “Barre Phillips et la danse” and is a collaboration with choreographer and improviser Emmanuelle Pépin. On January 16 the subject is “Barre Phillips et le cinéma” with special reference to Barre’s work with film-maker Robert Kramer. Jazz is the subject of the February 6 concert and features a Phillips quartet with Laurent Charles (saxophones), Patrice Soletti (guitar) and François Rossi (drums). Tél. : +33 (0)4 97 13 48 00. Un ricordo del poeta Adrian Mitchell si celebra il prossimo 9 dicembre a Londra, alla Queen Elizabeth Hall, in occasione della pubblicazione di una nuova raccolta di suoi scritti, Tell Me Lies. Intervengono nomi di spicco della letteratura britannica, del teatro e della musica, e tra questi anche Phil Minton, Chris Biscoe, Kate e Mike Westbrook per eseguire 'The Children of Blake' e 'Let The Slave'. Poet Laureate Carol Ann Duffy joins Patience Agbabi, John Hegley, Jackie Kay, Liz Lochhead, Roger McGough, Brian Patten and Michael Rosen to celebrate the life and poems of the late, great Adrian Mitchell. Mitchell changed the way we think about poetry, and his influence and celebratory instincts is felt at this amazing evening, which also marks the publication of Adrian's collection Tell Me Lies. Sasha Mitchell with Pete Moser and Mike Westbrook add musical flair and bring our poetry season to a rousing finale. The Department of Media & Communications Screen School and Sound Practice Research with Adventure Pictures and the BFI present leading British filmmaker Sally Potter (Orlando, The Tango lesson, The Man Who Cried, Yes, Rage) and internationally renowned composer, improviser and multi-instrumentalist Fred Frith give a masterclass on Music and Film. 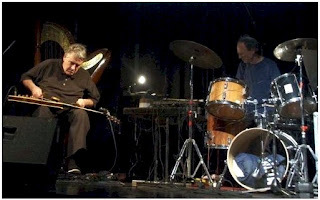 Following on from the afternoon's masterclass, Fred Frith and composer/percussionist Chris Cutler perform in the Great Hall. 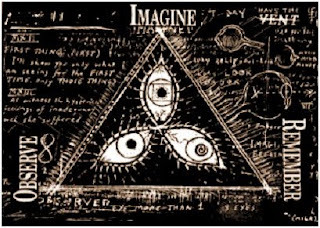 Dal seminario 'creativo' di dieci settimane tenuto all'Università di Warwick, Coventry tra il gennaio e il marzo scorsi proviene in buona parte il materiale raccolto nel libro di Peter Blegvad Imagine, Observe, Remember. Se ne trova documentazione presso il sito dell'Università, oltre a una conversazione in cui Blegvad illustra le premesse teoriche e gli esiti del corso, e il filmato di una performance da esso scaturita. Il libro è in distribuzione da ReR Megacorp e consigliato come un 'perfetto dono per Natale' (un po' come lo fu anche The Book of Leviathan). 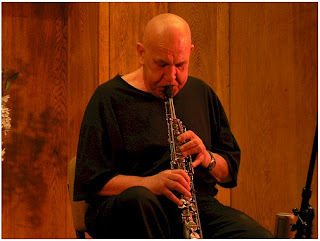 Per il sessantesimo compleanno di Paul Lovens il festival Phonomanie si trasforma questo fine settimana in un gran festa tra amici e ammiratori, nell'intimo e accogliente Jazzatelier di Ulrichsberg, in Austria: dal 4 al 6 dicembre partecipano in varie combinazioni Paul Lytton, Evan Parker, Alexander von Schlippenbach, Eugene Chadbourne, John Edwards, Paul Hubweber, Günter Christmann, Mats Gustafson, Michael Moore, Phil Wachsmann, Sabina Meyer, Radu Malfatti, Klaus Filip, Tobias Delius, Rudi Mahall, Wilbert de Joode, Serigne C.M. Gueye, John Russell, Carlos Zingaro, Hans Reichel e Wolfgang Mitte.